For 83 years generations of residents and visitors have learned to play golf on the historic 9-hole course in Neskowin Village. But it always has meant much more to the community. The large, park-like, open space contributes to the atmosphere and desirability of the village. The course plays an important role in the local economy. For about seven months each year it has attracted golfers and their families to enjoy everything the small coastal community has to offer. But each winter brings the annual flooding, when the geese and elk always outnumber the golfers. Neskowin Beach Golf Course was designed by Ercel Kay in 1932. Using horse-drawn implements, Kay carved the fairways and greens to preserve the natural contours of the land. Yes, that is Jack Benny in the 1959 photo above, posing with Helen Dettweiler, one of the founders of the Ladies Professional Golf Association, who often taught lessons at the course. Benny is said to have shot an 84 when he visited Neskowin Beach. Last September, after the regular Tuesday evening tournament, Neskowin Beach Golf Course’s longtime owner announced to the local players that he wouldn’t be reopening the course in the spring. Nor was he planning on selling the business. Tom Eaton and Cathleen Callahan both had roots in Neskowin since their childhoods. That’s Cathleen’s grandmother posing on the seventh tee 75 years ago in the photo on the right above. Now part-time residents, Tom and Cathleen knew that something had to be done so that future generations could enjoy the course as much as they had. Tom emailed eight neighbors, inviting them to come to their home to discuss what could be done. 31 people showed up. 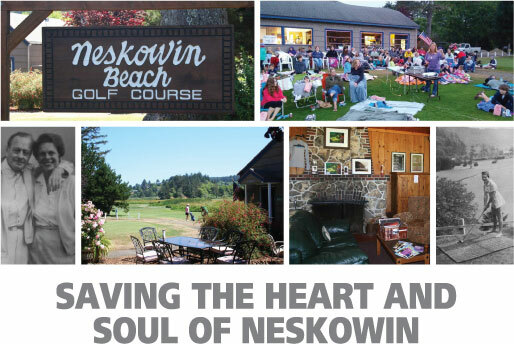 The consensus was that the course was “the heart and soul of Neskowin”. It had to be saved. A volunteer committee was formed to explore the viability of various options. Several months passed as the group looked for a buyer or partner that could help them achieve their goal. With none found, the group began negotiations with the course owner, Tom Clark. Clark agreed to sell to the community. In early May a new non-profit corporation, Neskowin Beach Golf Course, Inc., entered into a lease/purchase agreement with Clark. The volunteer board of directors estimated that a million dollars would eventually have to be raised to cover both the purchase price and annual operating expenses. Knowing that some would contribute more, and some less, the committee’s goal became “200 families, each contributing $5000”. 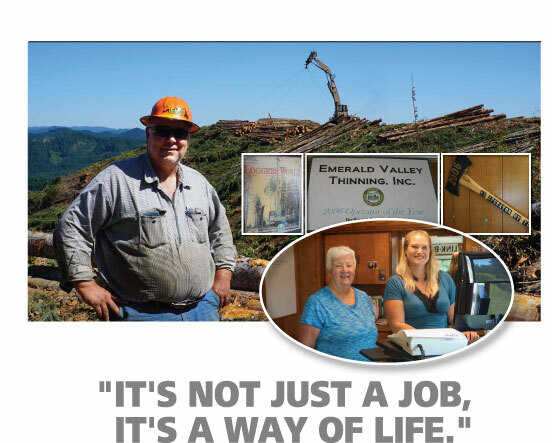 With 1,450 homeowners in the Neskowin area, they felt the goal was attainable. Operating entirely through volunteer labor, the course was readied for its annual spring opening. The entire community was invited to the May 24th event and more than 220 people attended to learn how they could help. Contributors were offered various membership options with affordable annual dues in future years. The initial fundraising went well. On July 13th, the committee exercised their purchase option and the non-profit corporation now owns the property. Within two months, they had raised more than $400,000. The course is now more popular than ever – over 1500 rounds a month are being played. Lyle Rowland, a retired high school teacher and golf coach, leads a group of eight volunteers maintaining the course. His wife, Pam, has organized eight other volunteers to operate the historic clubhouse. Local families and businesses have donated materials and labor to return the course to pristine condition. The committee plans to hire a manager and grounds crew for future seasons, but community volunteers will always play a big role. One of the goals of Neskowin Beach Golf Course, Inc. is that the property can be enjoyed by the entire community, including non-golfers. Free movie nights are now held weekly on the first tee (see photo above). A disc golf tournament was a sellout. A croquet tournament and nature walks are now in the planning stages. The committee is even considering how the property can be used for birders in the off-season, perhaps providing coffee and soup in the clubhouse. At Oregon Coast Bank, we’re honored that Neskowin Beach Golf Course, Inc. opened their accounts at our Pacific City office. It’s been great to see Neskowin band together to save such an important community asset. Their business plan is solid. The many volunteers deserve a great deal of credit.